Seven authoritative contributions to the emerging field of pedagogy and to comparative, cultural and policy studies in education. A must for those who want to do more than merely comply with received versions of `best practice'. Pedagogy is at last gaining the attention in English-speaking countries which it has long enjoyed elsewhere. But is it the right kind of attention? Do we still tend to equate pedagogy with teaching technique and little more? Now that governments, too, have become interested in it, is pedagogy a proper matter for public policy and official prescription? 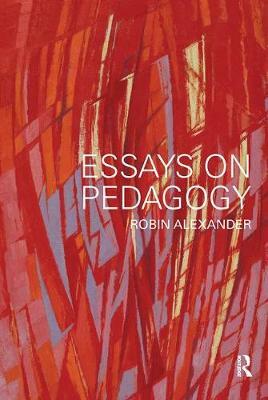 In Essays on Pedagogy, Robin Alexander brings together some of his most powerful recent writing, drawing on research undertaken in Britain and other countries, to illustrate his view that to engage properly with pedagogy we need to apply cultural, historical and international perspectives, as well as evidence on how children most effectively learn and teachers most productively teach. the scope and character of pedagogy itself, as a field of enquiry and action. For those who see teachers as thinking professionals, rather than as technicians who merely comply with received views of `best practice', this book will open minds while maintaining a practical focus. For student teachers it will provide a framework for their development. Its strong and consistent international perspective will be of interest to educational comparativists, but is also an essential response to globalisation and the predicaments now facing humanity as a whole.